Google has been granted a patent for driverless car technology, which can fully take over the control of a vehicle from a human driver. This full-fat version of cruise control uses web functionality to trigger the automated driving tech, with one of the images which goes alongside the patent showcasing what seems to be a massive QR code embedded into a road. It seems that once a driver of one of Google's automatic cars drives over the QR code – or reference indicator, as it is called in the patent – the car then takes over the controls. 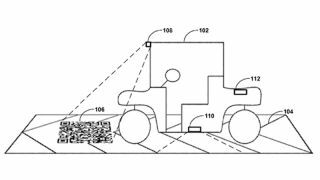 The actual patent is written in rather oblique language but does reveal a little about what Google's vision of driverless cars is. "Disclosed are methods and devices for transitioning a mixed-mode autonomous vehicle from a human driven mode to an autonomously driven mode," said the patent. "Transitioning may include stopping a vehicle on a predefined landing strip and detecting a reference indicator. Based on the reference indicator, the vehicle may be able to know its exact position. "Additionally, the vehicle may use the reference indictor to obtain an autonomous vehicle instruction via a URL. After the vehicle knows its precise location and has an autonomous vehicle instruction, it can operate in autonomous mode." Google has been looking into the idea of driverless cars for a while now and even outlined its proposal for an automatic car in its last Zeitgeist, where Larry Page explained: "It's an area that I've had some interest in since I was a grad student. It seemed pretty practical actually, I mean you think that driving a car is hard but it is not actually that hard for a computer if [it] has good data about what's about it." There's no actual timeline for when we will see these cars in action but an automated car has been spotted driving around Google's Mountain View campus.